Central to understanding the necessity of Chiropractic is understanding that healthy spinal bones and tissues and healthy spinal nerve flow depend on normal spinal motion and alignment. Decreases in spinal motion and abnormal alignment and posture result in spinal bone and soft tissue decay and unhealthy spinal nerve flow. The scientific term for this degenerative spine and nervous system condition is Vertebral Subluxation Complex. Vertebral Subluxation Degeneration or Osteoarthritis can cause a great deal of pain, weakness, and/or fatigue. More importantly, this decay can be causing damage WITHOUT symptoms, just like diabetes, cancer, and heart disease. The detrimental neurological changes that occur with Vertebral Subluxation Complex, and the one that is most damaging in terms of overall health, is the toxic flow of stress nerve messages (called nociception) and the deficient flow of essential positive nerve messages (called proprioception) between the body and brain. Scientific evidence indicates that this altered nerve flow affects not only local spinal tissues but brain function in regions that regulate pain, stress and immunity, thinking, learning, concentration, emotions, organ function, sleep, digestion, overall hormonal and organ function regulation, and neuromuscular coordination, balance, strength and agility. 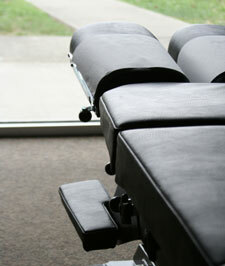 Fact: Doctors of Chiropractic are experts in detecting and correcting Vertebral Subluxation Complex. Our Forestville chiropractor uses a combination of modern, state-of-the-art chiropractic techniques and lifestyle interventions that are scientific, ethical and evidence-based for clinical effectiveness. This isn’t to say that individual results don’t vary, but rest assured, the lifestyle recommendations you’ll been given over the course of your care are supported by one of the most evidence-based protocols for spinal recovery, wellness and prevention. We ALWAYS address the cause of the problem and focus on restoring spinal health and function and improving and/or maintaining spine related quality of life. Our favourite client is someone who values their health. Once explained, they understand the role of a healthy spine and the value in regular chiropractic adjustments as an integral part of their recovery. They agree with our logical and scientific approach to health and once their initial problems have resolved, adopt Chiropractic care over a lifetime to help support optimal health for their entire family. Give our Forestville chiropractic practice a call to schedule an appointment for your whole family today!